Number of the map: 1 - Alternative: 1A - Length: 9 km. - Journey time: 3 h 30í - Difficulty: easy - Alternative: 1B - Length: 13 km. - Journey time: 5 h - Difficulty: medium-easy - Alternative: 1C - Length: 16 km. - Journey time: 6 h - Difficulty: medium - Sign posting: scarce - Feasibility: by foot, by bike, by horseback (only partially). 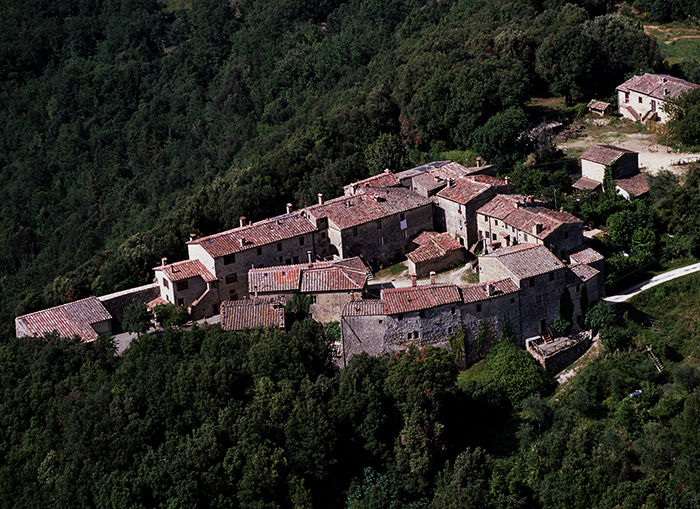 - Places off interest: Iesa, buca dei Falchi, La Pigna. Tocchi and Castello di Tocchi. Note: A very rich itinerary from a naturalistic viewpoint or the alternative viewpoint 1 c) architecturally historic. 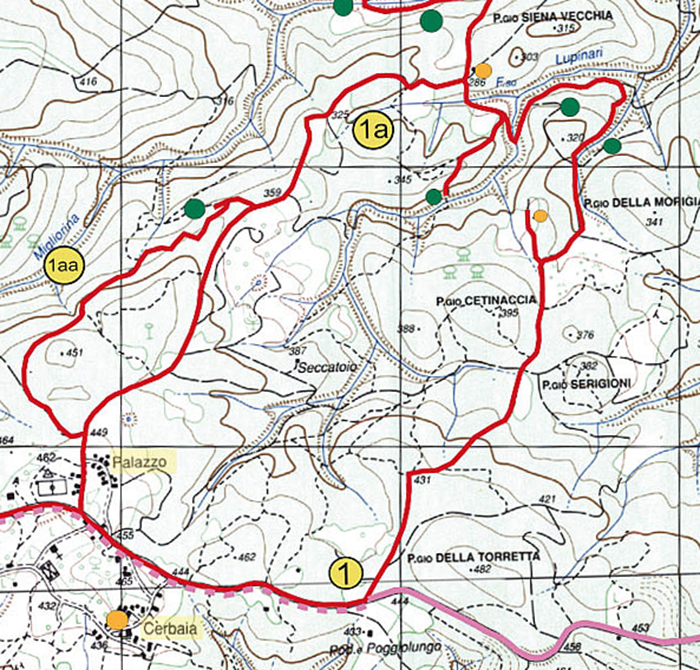 The central piece along the Fosso dei Lupinari creek, common to the three alternatives, although brief is demanding and obliges those wanting to go by bike to push it by hand. The itinerary present other very demanding parts which however can be affronted by pedalling, for good cyclists. 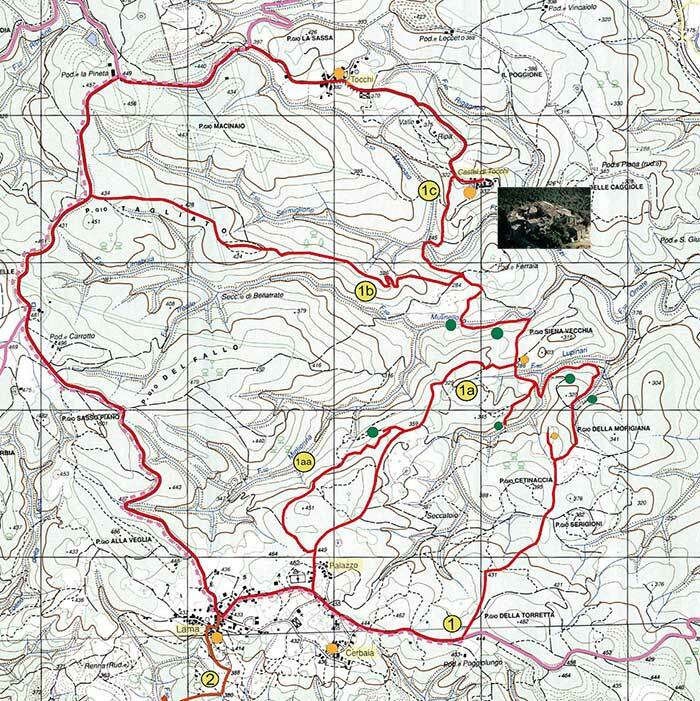 We recommend to walk the route 1 a) were you can enjoy the really grandious nature. 1 b) and 1 c) in mountain bike, which offers a satisfaction in the second part, which repays the difficulties met in the first part, without doubt. Besides all the last part from “La Pineta” up to the Lama could prove a long walk, using a road that, although very beautiful, little used and completely immersed in woods, is asphalted. We suggest following the itinerary 1 in all its variations in an anti-clockwise direction. The footpath 1 can be surely taken on horseback. For more information on this type of excursion contact PRO LOCO Monticiano. Lama is one of the four hamlets that make Iesa (the others are Palazzo, Solaia and Cerbaia ), marvellous and secluded village in the Farma Valley. Leaving in the main square in Lama, we take the asphalted road, surrounded by cork oaks, heading east, which arrives at the main Siena- Grosseto road. After about 2 km, we arrive on the left, a little before a small hut, to a gravely road (the barrier is always open). Shortly after leaving the asphalted road the oaks make way for the pine trees of the nearby “Poggio Torretta”. A characteristic of this itinerary is in fact the presence of pine trees on all the main knolls. At the first junction, after 50 m, we keep tight and continue on the flat for another 10 m or so. As we omit a right hand junction, the road begins a steep decline into a flourishing oak and chestnut forest until we arrive after about 500 m to a crossroad where we go straight on in a northerly direction. The road continues to descend and the vegetation becomes Mediterranean undergrowth. After a little less than one km, veering left from the main footpath we arrive at a lovely resting place where some evergreen oaks surround the remains of a hut (335 m, see “emergenza storica” on the map). The ruins are made of blocks of limestone (cavernoso limestone), anomalous for the area where the quartz rooks of the Verrucano formation dominate. Returning into the main track we continue to descend for around 200 m. and near some poplars we take, on the left (300 m above sea level). After arriving at an open grassy area we will see four roads ahead follow the central path, which descends steeply, hugged on the right by a deep ditch. The view is beautiful as we descend (see “emergenza naturalistica” on the map) carry on downhill for around 350 m and we reach the Fosso dei Lupinari creek. The footpath runs close to the creek for some tens of meters, until a characteristic cutting appears on the right side of the creek. The cutting is strewn with enormous blocks of violet quartz rocks of the Verrucano formation. Similar blocks are also visible in the nearby creek. This an ideal place for a rest (see “emergenza naturalistica” on the map). A landslide blocks the footpath tracks. We continue beside the Lupinari creek in an EW direction taking care at the verge of the landslides. After about 200 m, the footpath returns to look like a mule track and forms a hairpin bend to the left. Before the bend we rejoin a footpath hidden by the vegetation, which continues straight on in an E-W direction. 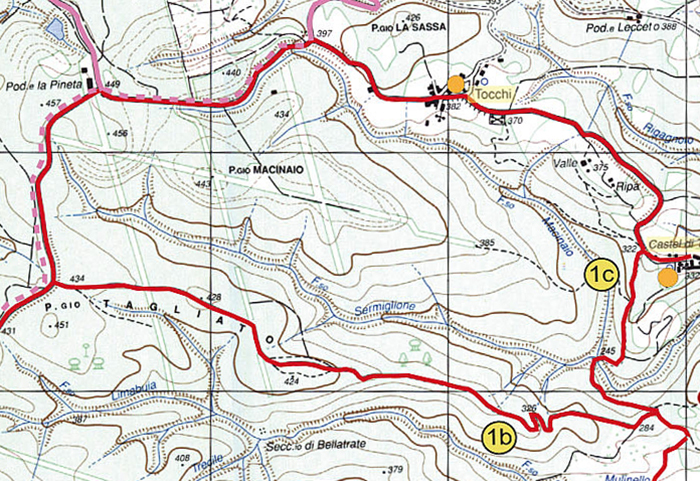 After a short way that is subject to landslides, the footpath crossed the Lupinari creek and climbs from the opposite side in a northerly direction, towards the “Poggio Siena Vecchia”, cutting through the woods. After about 10 m, we enter into a track on the left side of the Lupinari creek. 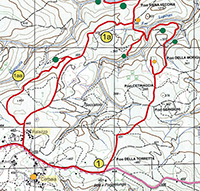 Taking a left turn, towards SW, after about 10 m we arrive at the entrance of the “Buca dei Falchi” cave (see “emergenza naturalistica” on the map). The cave is entirely visitable by contacting the Monticiano PRO LOCO and/or the Speleological Association “SPELEOSIENA”. To carry the itinerary instead, after crossing the Lupinari creek, we continue to the right of the footpath and, after 2 short hills we reach a crossroad taking the right hand road we arrive, after a few metres, to the remains of a characteristic ruin, an ideal place for a rest (see “emergenza storica” on the map). Returning to the crossroads there are two alternatives. 1a) Following the gravely road to the left, in a SW direction, after about 1,2 km, on the right, a very damaged road takes us, after a rapid decline, to a magnificent natural travertine balcony from which we observe the panorama of the Torrente Migliorina creek valley. A steep footpath on the right of the “balcony” takes us to a travertine wall. On the wall, a small calcareous cold water spring forms a lovely water fall, at the base of which small pools and travertine is forming. They create a fairy tale scene (see “emergenza naturalistica” on the map). The beauty and delicate harmony of this place, without deploration, maximum respect. The locals call this place the La Pigna (pine cone). Returning to the “balcony” we continue the footpath uphill until we return to the main road. We cover the road towards SW and after 1,3 km we reach the hamlet of Palazzo. If instead, from the “balcony” we proceed in the opposite direction to our arrival point, that is, toward SW, the footpath (indicated on the map by 1aa) is easily followed and after about 1 km, the houses of Palazzo are reached. Taking the asphalted road on the right in a westerly direction, after about 1 km, we reach Lama. 1 c) continuing left towards NW, after about1 km we reach Castello di Tocchi, a lovely second century hamlet, founded by the Ardengheschi family. It is worth, without doubt, a visit (see “emergenza storica” on the map). From Castello di Tocchi a gravely road in the NW direction, takes us to Tocchi, from where an asphalted road, still in the W-NW direction will take us to the road witch joins San Lorenzo a Merse to Monticiano. This road is one of the principal guides of the area. Following the left hand side, in a westerly direction, after around 800 m we reach the forestry commission building “La Pineta”. The left road in direction S-SW after around 5 km reaches Lama. 1 b) Following the left hand side, but in the E-W direction we reach, after a few metres, a junction. A barrier closes the road. We go on following the main road. If we take the footpath immediately to the left of the barrier we go down to the Mulinello creek (not indicated on the map). Continuing, the road constantly ascends, along the crest that separates the Mulinello creek from the Sermiglione ditch. After a little more than 2 km we cross a break-fire-line (cessa) and we go over it for about 100 m to leave it, deviating to the left after about 500 m the road crossed at right angles, a new breakfire- line and after around another 400 m. meets the asphalted road, coming from the forestry commission building “La Pineta”. We take the road on the left in a southerly direction and, after about 4 km. we reach Lama.